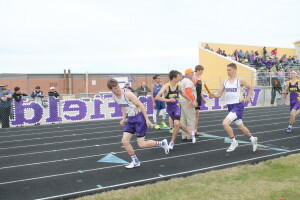 Cameron Kuil set a new meet and school record in the 100 at the Big Dakota Conference track meet on April 18 in Winner. The Winner senior ran the 100 in :10.42. This breaks the school record held by Chaz DeMers of :10.50 set in 2006. Other new meet records by Winner athletes were the girls 4×400 relay in a time of 4:19.41 and the girls 4×800 relay in a time of 10:18.13. Both Winner boys and girls track teams won the Big Dakota meet. In the 100 meter dash, Ellie Brozik broke the standard and qualified for the state track meet. Triple jump—Vrbka, 2nd, 30-07.50; Morgan Hammerbeck, 3rd, 30-07.